I haven’t read a book by Anne Tyler in a long time because – well – I’m not her biggest fan. The few I’ve read have been okay basically, but nothing to “watch this author” about. Yes, if your preference is realistically presented and character-driven novels Tyler might be your author. For me, great characters are wonderful, but I prefer idea- and plot-driven novels – just a preference. Tyler’s writing is adequate – actually, it’s pretty nice considering what kinds of books she writes – the effect of accumulated details is and dialogue draws the reader in and she structures it well enough there is some tension somewhere – in a bare-bones frame story if nothing else. .
With Tyler, as usual, there’s no “plot” to summarize and the themes, if there really are any, revolve around relationships. Tyler’s books seem to just move along slowly developing the lives of the characters over decades or generations. 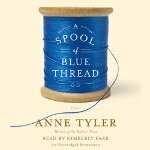 A Spool of Blue Thread, Tyler’s 20th novel, concerns four generations of Whitshanks in Baltimore – mostly all in one house. Basically, as a loose frame story, there are four adult children who become concerned for the welfare and future of their aging parents. The focus for most of the book is on Abbie Whitshank, wife, mother, grandmother, social worker and homemaker, but everyone has other relationships. But I wouldn’t call the house a character. The human characters are fully rounded, developed – the house is not, although it is central to the whole. It may be a character to Junior and Abbie, maybe to Red – to most of them it is a home (more than just a house) but not a “character” and quite a lot of the action in the book takes place in it. Abby and Red Whitshank are getting older, no denying that. Red has lost a bit of balance and hearing and Abby is losing some minutes here and there. But they’ve always been independent and almost stereotyped in their “normal-ness.” Creating very thoroughly rounded characters through detail laid upon detail, no matter how “normal” they are, is Tyler’s forte. Any plot development is completely character driven – and there are only a couple times Tyler seems to lose control. Or that may be me – I’m not sure about the reasons for some of the back-story scenes – why go back into all the stuff between Abbie and Dane and then put the story of Junior and Lennie Mae at the end? Why is Tyler using a non-linear structure at all? I suppose if there is no plot it really doesn’t matter because no character or scene can really add or take away from that. Overall – if you’re a Tyler fan I’d say go for it – if you’ve never tried one this is a good one as any – if you’ve read one or two and not been particularly thrilled, expect the same.